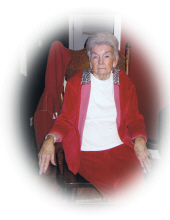 Annie Ruth Gates 92, of Ardmore,AL died Wednesday, April 3, 2019 at Limestone Health Facility, Athens, Alabama. Born Wednesday, June 9, 1926 in Limestone County, AL, she was the daughter of Charlie Davis and Dezzie Bell Davis. She was preceded in death by her parents; husband, Johnnie Gates; brothers,Thomas Davis and Houston Davis; sisters, Elizabeth Hargrove and Nell Dawson. She is survived by daughters, Carol June (David) Whitt of Toney, AL, Janice (Clayton) Emerson of Ardmore, AL and Beverly (David) Fox of Pulaski, TN; son, Phillip (Robin) Gaites of Presque Isle, ME, grandchildren, R.J. Gaites, Kelley Marquis, Jackie Emerson, Shane Emerson, Joshua Emerson, Jonatahan Fox, and Marianna Fox; 16 great grandchildren and 3 great-great grandchildren. A Public Visitation will be held on Sunday, April 7, 2019 at Ardmore Chapel Funeral Home, Ardmore, Alabama from 11:00 AM until 2:00 PM. A Funeral Service will be held on Sunday, April 7, 2019 at Ardmore Chapel Funeral Home, Ardmore, AL, at 2:00 PM with Bro. Steve Hargrove and Bro. Jamie Mitchell officiating. Burial will be in Gatlin Cemetery, Ardmore, AL. To send flowers or a remembrance gift to the family of Annie Ruth Gates, please visit our Tribute Store. "Email Address" would like to share the life celebration of Annie Ruth Gates. Click on the "link" to go to share a favorite memory or leave a condolence message for the family.